Plus ethical meat discourse from the Bay Area's top butchers. Let's get this out of the way: Mani Niall was Michael Jackson's personal chef for a few years in the Eighties. It wasn't a career-defining moment, and his other accomplishments have been a lot more substantive — starting an iconic artisan bakery, blazing trails for restricted-diet eaters, and writing three cookbooks. But if his association with the King of Pop helps get his name out there, Niall doesn't mind. For the last six years Niall kept a modest public profile as executive chef at Just Desserts, the San Francisco-based wholesale bakery with a huge facility near the Oakland Airport. 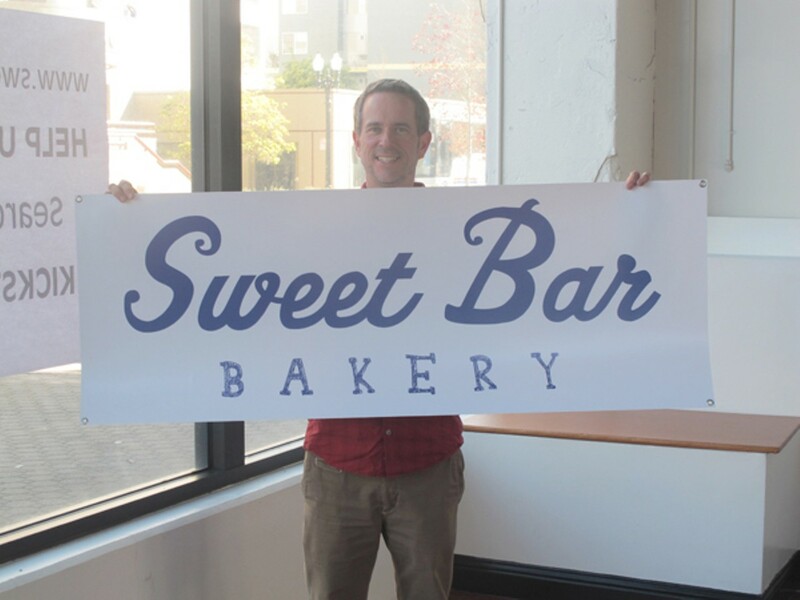 But now that he's opening Sweet Bar Bakery in Uptown, Niall wants you to remember his name. "At this point the Michael Jackson thing is kind of, like, 'Who cares?'" he said. "But I like how it gets people talking." In Southern California, Niall needs no introduction. In 1990 he started Mani's Bakery, an organic LA patisserie that gained wide notice for catering to emergent dietary trends. Celebs flocked to Mani's for his vegan and wheat-free baking, back before everyone was doing it. Niall eventually burned out, moved to the Bay, and became a product developer. He was drawn to Just Desserts by the allure of a consistent paycheck and benefits, but two years ago he got the itch to run his own business again. For months, Niall closely watched the struggling Mimosa Champagne Lounge on Broadway and 24th. When he got the text message "It closed," he pounced on the space. Niall is enamored with everything about his new location. It used to be a sweets shop called McFarlanes from 1946 to 1976. It's part of the well-worn Art Murmur footpath. The New Parkway is re-opening less than a block away. Uptown Uptown Uptown. Running 7 a.m. to 11 p.m., Sweet Bar will offer coffee and baked goods in the morning; sandwiches for the lunchtime worker bees; and beer and wine served late. Niall's baked goods will focus on the sweet, with extra love for vegans and gluten-free dieters. The next step is for Niall to close out his Kickstarter campaign. With only a few days left, he's looking to raise $12,000 with a bunch of donor perks: a muffin bearing your name, private cooking lessons, etc. Sweet Bar won't open until this summer, but Niall may host some pre-opening pop-ups to build the hype. It was standing-room only last week at Revival Bar and Kitchen in Berkeley, when four of the Bay's most prominent butchery experts got together for some meaty discourse. The free event came with tiny meat snacks and a big, chunky title: What Meat-Eaters Need to Know: Guidance On Making Good Food Choices From Experts In Carnivory. Said experts included Ryan Farr of 4505 Meats, Marissa Guggiana of The Butcher's Guild, Morgan Maki of Bi-Rite Market, and Peter Hertzmann, author of Knife Skills: Illustrated. The discussion's main theme was raising consumer consciousness, and the ways ethical meat purveyors can take on an instructor's role. For instance, Maki loves educating Bi-Rite shoppers on whole-animal butchery, schooling them on the strengths and preparations of less glamorous cuts. However, even if you stick with off-brand animal parts (hearts and offal were repeatedly mentioned), Maki acknowledged that pasture-raised, sustainable meat costs significantly more than its factory-farmed counterparts. Hertzmann, who teaches butchering skills to minimum-security prison inmates, at one point mentioned that his students "can't afford to shop at Bi-Rite." One audience member (an employee of Berkeley's whole-animal butchery The Local Butcher Shop) said he has friends who still eat at McDonald's. He wanted to know how to convince them to purchase better meat. Guggiana's retort, "Make it delicious!," got a few chuckles. Maki then shared an anecdote about an eye-opening course he taught on how to butcher chicken and make it into soup. It was a nice story, but it involved students who had the intellectual curiosity (and means) to sign up for a butchery class. How do you reach people who doggedly eat fast-food meat? I recently interviewed an NYU food studies professor who said that Americans who buy non-factory-farmed meat are still "so few as to be statistically insignificant." Last week's panelists were stoked about how savvy meat shoppers are becoming, but the Bay Area can be something of an echo chamber. It's one thing to make an impact on people who shop at Bi-Rite and who have seen Food Inc. It's something else entirely to reach consumers outside the food-forward bubble, and convince them to spend double for a pastured whole chicken.